The Hypothetical Case of the Out-of-Place Seed Mix -- what doesn't belong here? THIS IS AN EXERCISE using a hypothetical seed mix, and what the results might be five years later. The exercise is for you to determine which species of the mix are out of place. Along Highway 99, five miles north of Bakersfield in Kern County, if you sowed a hypothetical seed mix in the median, at the rate of about 60 pounds per acre. 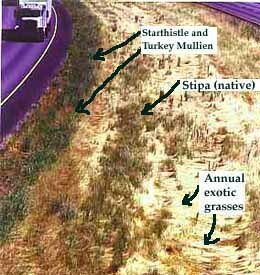 After five years, the only survivors might be a thin stand of Stipa in amongst exotic annual grasses, plus a strip of star thistle and turkey mullien in the road-edge spray-zone. percent....species................YES...NO.<< Is each a full-sun dry-soil San Joaquin Valley native?